Can you solve the puzzles necessary, in the escape rooms, to complete your task before your time has expired? Our escape rooms will challenge your abilities to work as a team, to think outside the box, to pay attention to detail and work under pressure. If you are willing to accept this challenge then click here to be accepted into Escape Zone 60. Minimum age allowed in the rooms is 9. Not sure if you are up to the task of completing an escape room? Read on or check out our Reviews and FAQ page. Escape Zone 60 is a live, interactive, fun, puzzle solving game where you have 60 minutes to solve the puzzles needed to complete your goal of escaping the room before time is up. No special skills are required, only an interest to succeed and have Fun. The games begin with a briefing, on the escape room you have chosen, where our staff will discuss the rules and answer any questions you may have. Depending on the escape room you choose, there may be up to 6 to 10 players. The minimum required is four. Successful completion rates for the escape room average around 30%, depending on the room. Average FUN rating of all escape rooms are 100%. So even if you don’t escape, you will be a winner! Watch for our newest escape room on wheels to come to an event near you. Escape Zone 60 has the largest selection of Gulfcoast live escape rooms in the Florida Panhandle with over 12 escape rooms to choose from and more coming soon. 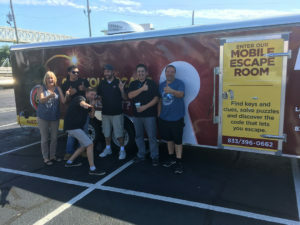 Add in our team building escape rooms, mobile escape room, virtual reality escape rooms and portable escape rooms along with the fact that we have been running escape rooms longer than anyone else on the Florida Gulfcoast, it is clear that Escape Zone 60 is your best choice for live escape rooms. 3 escape rooms to choose from at our new Sandestin, Miramar Beach location. Click on Book Now and be one of the first to check it out. Not only did we have a blast, but this activity really brought out the best in everybody. We’ve been talking among ourselves since escaping, and noting that we had legitimate participation and contribution from every team member. Highly engaging, morale boosting, communication inducing, and FUN! Our newest location in the Sandestin, Miramar Beach area will be open by Christmas. If you have played any of our locations you will be impressed with our newest addition. If you have not played an escape room, come check us out, you won’t be disappointed.